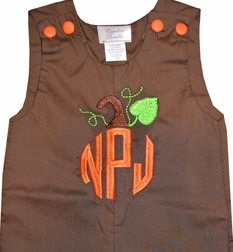 Here we have our adorable pumpkin monogram John John, longall or shirt and pants. We start with solid brown fabric and craft either a John John, longall or pants. The shoulders of the John John and longall fasten with small orange covered buttons. The pants have orange gingham cuffs and are paired with a white shirt. 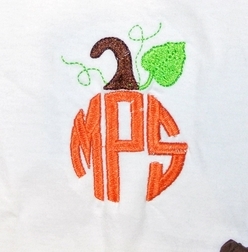 The John John, longall and shirt are monogrammed with your little one's 3 initials in the shape of a round pumpkin and have a pumpkin stem, vine and leaf embroidered on top. 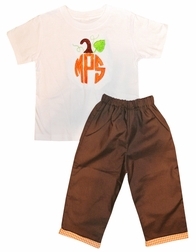 If you choose the pants set, the pants are also made with brown fabric and have orange gingham cuffs.